The Apalis TK1 is the most powerful Toradex System on Module (SoM) yet. Its CUDA-compatible NVIDIA® Kepler GPU is capable of rendering not only amazing 4K graphics but also provides an ideal platform to accelerate the processing of various applications such as Computer Vision or Deep Learning. In many cases, you can even replace FPGAs, DSPs, or even create totally new features with this GPU. 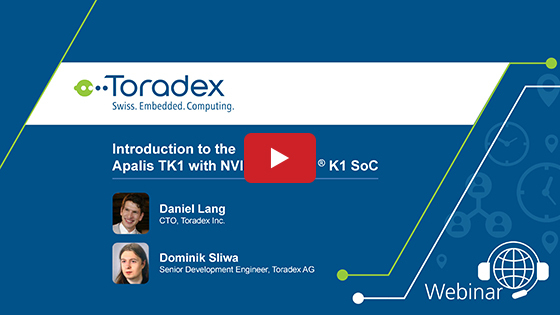 In this webinar video, you will learn about the Apalis TK1 SoM and how it can transform your product. Wel demonstrate the first steps in using the module and some demos from Toradex and its partners.